It was Ice Cream day yesterday. 31-ice-cream holds a charity event on the second Saturday of May every year. People who donate money can get ice cream for free from 10:00 a.m to 12:00 p.m.
We went to one of the shops near our house and donated some. 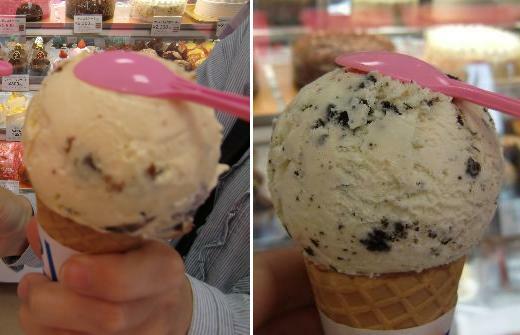 I chose Oreo Cookie's ice cream, my wife was Rum Raisin. The ice cream I chose was.....it was OK. But, my wife's one was tasty ! So, we shared the two each other. I'd like to join the event next year again and choose another one.